Follow @scholasticaLR for law review updates! We’ve created a new Scholastica Twitter account for all things law review—@scholasticaLR. Be one of the first to follow the new account and get the latest law review opening and submission season resource updates! There’s a new way to stay on top of all things law review— Scholastica’s recently launched Law Review Twitter account @scholasticaLR. The Scholastica Law Review Twitter account is devoted exclusively to sharing law review updates and resources—from journal openings to submission season tips and tricks. We created the new law review Twitter account to give legal scholars and law review editors an easier way to stay on top of the latest law review content. With the new @scholasticaLR Twitter account you’ll be able to just see the law review news and updates you’re looking for without having to scroll through content about other types of journals or disciplines. Read on for the details of what you can expect from following @scholasticaLR! 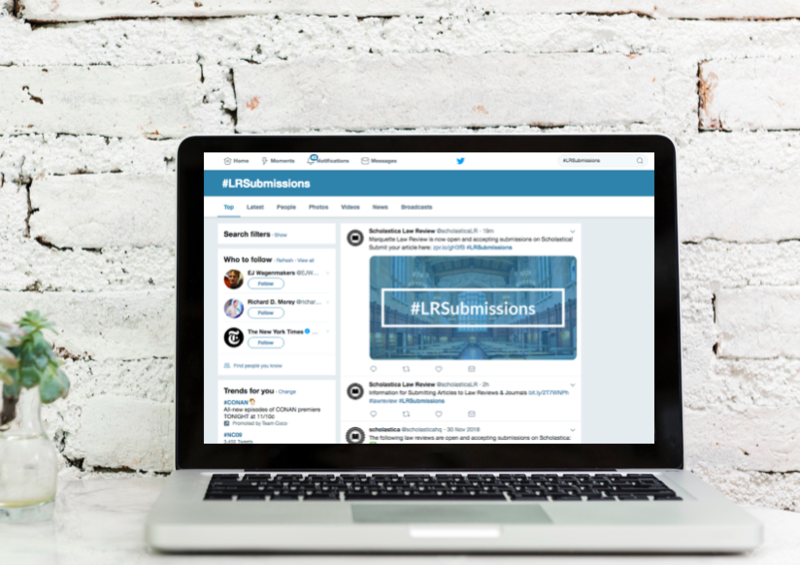 In recent years, we’ve been posting all of the latest law review opening announcements on the main Scholastica Twitter account using the hashtag #LRSubmissions. Now, we’ll be moving all #LRSubmissions journal opening announcement tweets to the new @scholasticaLR Twitter account and sending out journal opening updates even faster. Law review opening announcements are now automatically posted to the @scholasticaLR account as soon as they occur, so you’ll be the first to know when a law review has opened for submissions. All law review opening updates include a link to the law review’s “For Authors” page so authors can quickly access its submission guidelines. Authors will appreciate any submission updates you can give them! Additionally, we’ll be sharing links to the law review and legal scholarship spotlights we post on the Scholastica blog. Recent spotlights include an interview about the launch of The Michigan Journal of Law and Mobility and an interview about Harvard’s Caselaw Access Project. The new @scholasticaLR Twitter account will be devoted exclusively to law review news and updates serving as your one-stop-shop for all things law review. We will be phasing out all law review related posts from our main Twitter account over the next few weeks, so be sure to follow @scholasticaLR if you want to keep seeing law review announcements! We encourage editors and authors to follow the new account and the journal opening hashtag #LRSubmissions. The first in a series of data-driven law review posts, this post provides insight into when law reviews receive submissions.